But deep inside your aquarium a cycle is occurring. The nitrogen cycle to be exact. To a beginner, the nitrogen cycle can be a difficult concept to understand. Today, I am going to break the entire cycle down into easy-to-manage chunks. By the time you are done reading this guide, you will have a complete understanding of the nitrogen cycle – even if you have never owned an aquarium! Remember how I told you the nitrogen cycle was invisible? Well, that isn’t entirely true – some of it is visible. In fact, you participate in the nitrogen cycle without realizing it! 1. You feed your fish food, and any uneaten food becomes waste. 2. 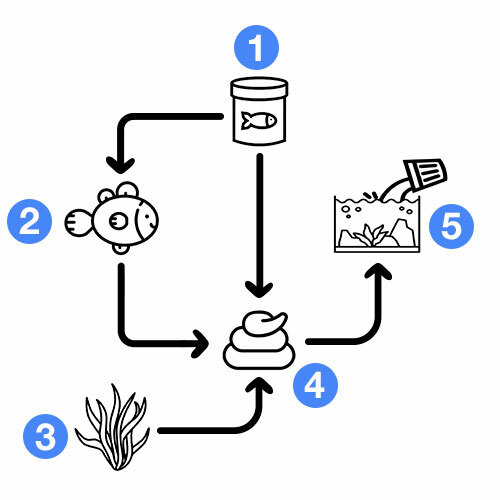 Your fish eats the food and poops – more waste. 3. Any plants in your tank will drop dead leaves – more waste. 4. And, all this waste starts to build up. 5. You perform a water change to clean it. Well, the full nitrogen cycle is only slightly more complicated than that. 2. Your fish eat the food and poop – more waste. 3. The waste in your tank builds up. 4. As the waste begins to break down and decay, it releases ammonia. 5. Bacteria then convert the ammonia to nitrite. 6. A different type of bacteria then converts the nitrite to nitrate. 7. Plants use nitrates for growth, removing a small amount from the water. Any dead leaves from the plants become waste. 8. A large amount of nitrates are removed with your water change. This is the nitrogen cycle. See – I told you it wasn’t that hard to understand! And, even though you can’t see it, this entire process is constantly unfolding in your aquarium. 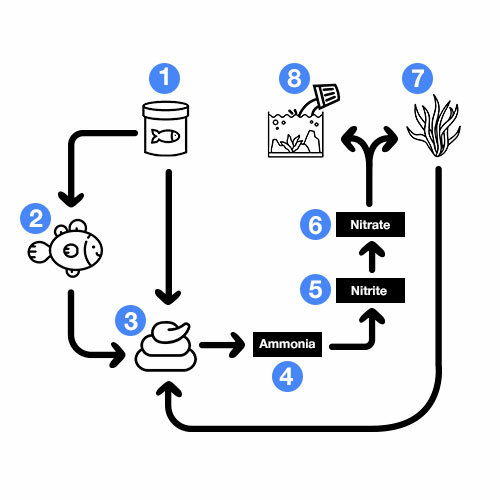 When someone says that you need to cycle your fish tank, they are talking about the process that happens in steps 4, 5 and 6 – ammonia, nitrite and nitrate – in the diagram above. These three steps form the basic fundamentals of fish keeping. Seriously, you would be amazed at just how many problems can be attributed to ammonia, nitrite and nitrate – these invisible chemicals are troublemakers. Unless you have plans to become a fish serial killer, it is vital that you have a deep understanding of the nitrogen cycle. Now that you have an understanding of the basics, it’s time to build on this knowledge. Just a little bit longer until you know everything about the nitrogen cycle. It will all be worth it when you use what you learn to raise happy and healthy fish! So, let’s take a closer look at the part of the nitrogen cycle that you can’t see. While it may not be the first step, ammonia is considered to be the beginning of the nitrogen cycle. Ammonia is introduced into your aquarium as waste breaks down. Basically, if it’s organic and starts to decay, it has the potential to release ammonia into your aquarium. But the transformation from ammonia to nitrite doesn’t happen on its own. It gets a little help from bacteria called nitrosomonas. Don’t worry about remembering that name. All you need to know is that this one type of bacteria feeds on ammonia. And when it does, it produces nitrites. Once a colony of this bacteria is established, it can eat ammonia as fast as it is produced from decaying waste. The problem is that nitrites are highly toxic to fish. Be careful not to get confused– the names are incredibly similar, with just one letter separating the two. Nitrates are produced when a second bacteria – called nitrobacter – eats the nitrites. Again, once a colony of this bacteria is established, it can eat nitrites as quickly as they are produced. Nitrates are much less harmful to your fish, as long as the quantity doesn’t get out of control. While plants and some bacteria help remove nitrates from the water, for the majority of aquariums, it won’t be enough to stop nitrates from building up to dangerous levels. Nitrates are considered to be the end of the nitrogen cycle since they continue to accumulate until you step in and perform a water change. This is one of the reasons why you continually need to perform water changes – to maintain nitrate levels. Congratulations, you have successfully learned all you need to know about the nitrogen cycle! It is important to note that the nitrogen cycle is actually a delicate balance. And, a major part of fish keeping comes down to maintaining a healthy nitrogen cycle. Because when the cycle becomes unbalanced, major problems quickly arise. A spike in ammonia, nitrite or nitrate can throw your aquarium into chaos. Let’s say that you clean your filter and accidentally kill all the bacteria inside. With no bacteria to break them down, the ammonia and nitrite levels in your tank will spike, possibly killing your fish. Likewise, a fish tank with an excessively high bioload might produce ammonia and nitrites at a faster rate than the bacteria can break them down. As you can see, an unbalanced nitrogen cycle provides clues that something else is not right in your tank. FishLab Fact: Encouraging the growth of this bacteria in your filter, so that it it removes ammonia and nitrites from your aquarium is called biological filtration. Monitor the nitrogen cycle in your tank by regularly testing your ammonia, nitrite and nitrate levels – by using an aquarium test kit. If you can find a nice balance with the nitrogen cycle, you will be rewarded with happy and healthy fish. Remember how I mentioned that there are two types of bacteria in the nitrogen cycle? One turns ammonia into nitrites, and another turns nitrites into nitrates. FishLab Fact: The bacteria that convert ammonia to nitrites and nitrites to nitrates are called nitrifying bacteria. A new aquarium doesn’t have enough of these bacteria to break down ammonia and nitrites in your tank. The result is water that can make your fish sick or worse: kill them outright. That’s where cycling your tank comes in. When you cycle your aquarium, you are essentially waiting for these two bacteria to grow in number until they can eat ammonia and nitrites as quickly as they are produced – keeping their respective levels at zero. 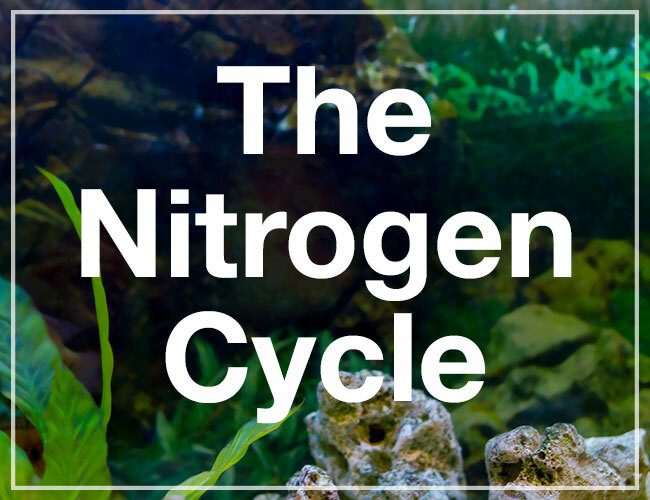 So now that you know about the nitrogen cycle and its importance in a healthy aquarium, it’s time to experience it firsthand and cycle your aquarium! You mis-stated nitrites in one place it should read ammonia. “…All you need to know is that this one type of bacteria feeds on ammonia. And when it does, it produces nitrites. So I did. Thanks so much for your eagle eyes. I have updated the guide to correct this. 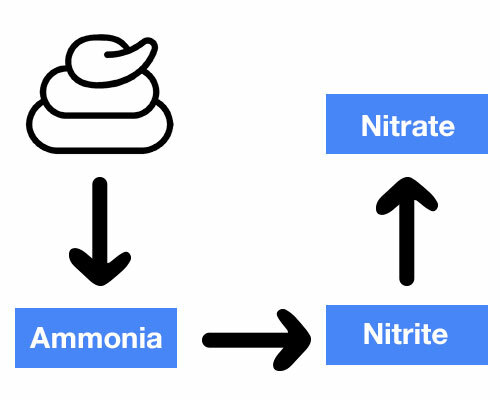 The diagram shows nitrate first. Thanks so much for pointing this out. I have had our designer fix it up so the diagram is now correct. I appreciate your sharp eyes!